The Oscars may be finished for another year, but that doesn't mean that the awards season is completely over. Last weekend saw the spotlight shift to Japan, where the Japan Academy Prize ceremony took place on March 3rd. There was a surprise outcome in the Animation Of The Year award, which saw In This Corner of The World take the top prize. The category had been assumed by many to be pretty much in the bag for Makoto Shinkai's Your Name, which has been both a critical and commercial smash hit both in Japan and overseas- becoming the highest grossing anime to date internationally. 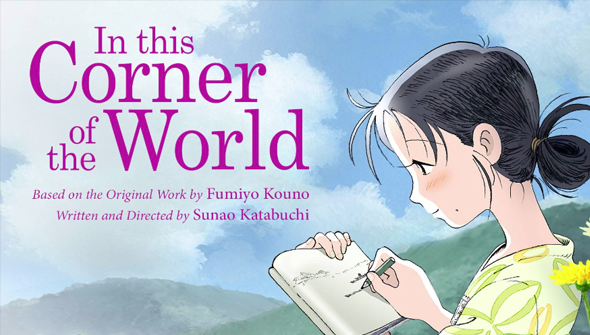 In This Corner of The World is an animated drama following a young woman in wartime Japan, that will come to cinemas the UK and US later this year. The Sunao Katabuchi directed film is a much less commercial effort than Your Name but it was still a box-office success and featured on many critics 'best of' 2016 lists in Japan. A Silent Voice, One Piece Film Gold and Rudolph The Black Cat were also nominated. Shinkai's film was not completely overlooked elsewhere, however. Your Name won awards for Best Screenplay Of The Year, Outstanding Achievement in Music and the All Night Nippon Wadai-Shō Prize (which is voted for by the public). Anime fans might also be interested in the fact that the biggest winner overall was Shin Godzilla, directed by Hideaki Anno- creator of Neon Genesis Evangelion. The reboot of the classic series won several awards including those for Best Picture and Best Director. Zootopia was nominated for Best Foreign Film, but lost out to Clint Eastwood's drama Sully.